Property 3: The Hollinsed House - Harvey's Haven - Great Location!! Property 8: Southernmost Retreat: 2 Blocks from Duval in Old Town. Property 10: "TIDES ON SIMONTON" ~ Perfectly located just off Duval and all the fun! Property 14: Family House- Two K bedrooms, 1.5 baths, Pvt.Spa in Garden Setting-Shared Pools! Property 18: "SEAPORT SANCTUARY" ~ Come and Enjoy this Romantic & Lovely Couples Hideaway! Property 20: ~ SOLARIS GARDEN ~ Enjoy Old Town Livin' Just A Short Walk to All the Action! Property 22: Your Private Oasis in Old Town Key West - The Cigar Maker's Tropical Cottage! Property 23: McCartney's Manor- Luxury Private Cottage, Courtyard and Hot Tub! Property 29: Cozy cottage w/ porch & great walking location - close to beach, small dogs OK! Property 38: Centrally located home w/ private pool 3 blocks to Duval St - dogs OK! Property 40: Starr's Suite-Luxurious 2 Person Suite Steps From Duval Street! Property 41: Cozy cottage w/ private hot tub, tranquil garden & parking - dogs OK! Property 43: Harrison's Hideaway - Cottage, Pvt. Spa - 2 Shared Pools - Steps from Duval St.
Property 44: Enjoy private hot tub at KEY WEST GINGER HOUSE. YOUR FIDO IS WELCOME TOO! Property 46: Delanos Bungalow - Stylish Seclusion in a Private Setting. 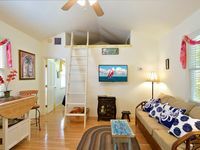 One Bedroom Pool Cottage, best Old Town location, walk everywhere! Property 50: One Bedroom Pool Cottage, best Old Town location, walk everywhere! The stay at Villa Cubana was perfect. My husband and I rented this place to take our kids and my granddaughter. My husband and I were not able to go because of a medical emergency that happened the morning before we were suppose to leave but we begged our kids to take our granddaughter and to enjoy. They were so happy with the place. Location was perfect and the house had everything you would need. Rating Details: The property manager was very helpful. The vacation rental was spotless. I was very happy with the location. I was very satisfied with the condition of the vacation rental. Overall, I recommend this vacation rental. Reviewer Comments: I&amp;#x2019;ve been coming down to Key West for the past twenty years and have rented many houses over this time. Over the years, we have stayed in the Seaport area since this feels more like a way of life and not just a few days of vacation. This particular rental location was fabulous! A one-bedroom big enough for 2-3 people with all the necessary amenities. We used the gas BBQ and shared pool many times during our stay. Upon our arrival, everything was clean and easy to access all areas. Since we rented for one month, the scheduled mid-cleanup gave us more time to use the pool. These units are individually owned so some owners are always around if you need information about the area and what is available to you as &amp;#x201C;A Local&amp;#x201D;. People are always friendly in Key West. This goes without saying, the staff at Best of Key West Rentals is wonderful. They are all very professional, helpful and understanding. During our stay, the A/C stopped working on a Sunday evening. We called our management staff and they had someone there within an hour, who was also able to fix our problem. Staff informed us every step of the way about what to do upon arrival and departure. We would definitely recommend this property and any other properties which are managed by Best of Key West Rentals.